Lachiya was born in Kpalbe. She grew up there until her teens when she went to live with her aunt in Takpuli. 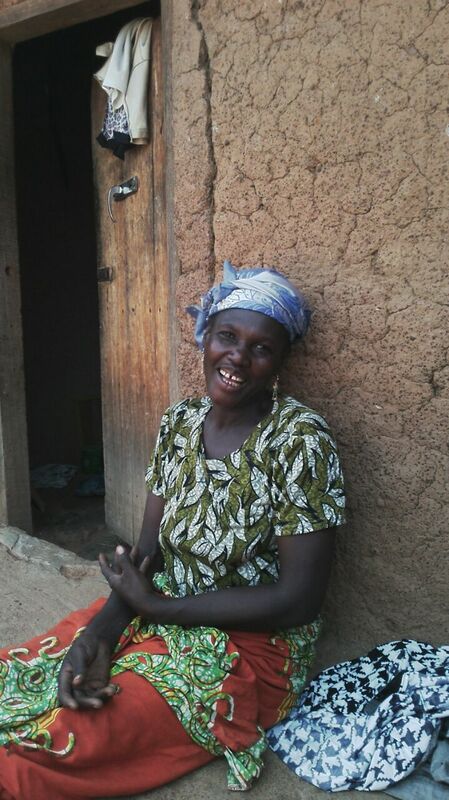 She later got married in Takpuli and has given birth to four kids: three girls and a boy. Before joining Saha Global, she farmed rice and groundnuts. 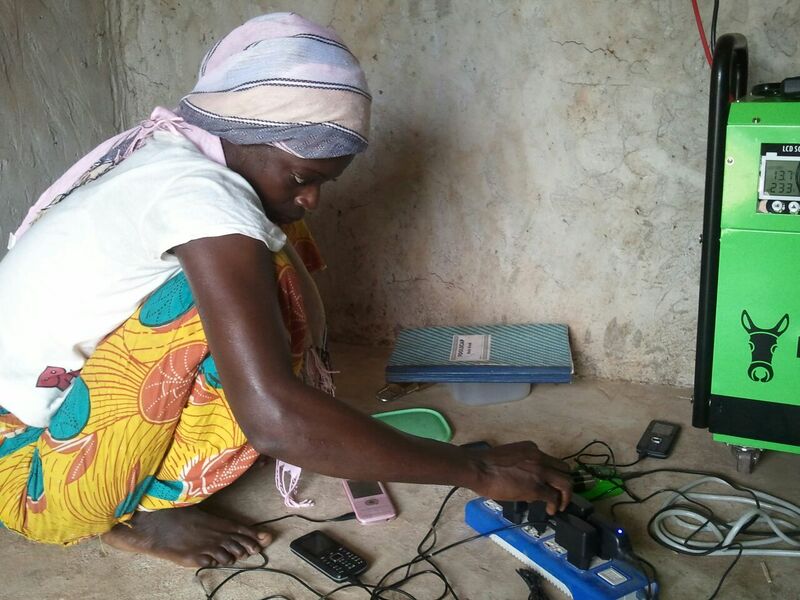 She still farms alongside running the water and solar businesses. She also sells firewood. My name is Matt. I’m 20 years old studying Industrial and Systems Engineering at Virginia Tech, and I was a field rep for the 2015 Winter Global Leadership Program. Over my first few years of college I was pretty focused the pursuit of “success” after graduation, which I figured involved landing a job and making money. I started doing web development for a consulting firm and things seemed to be falling into place, but by the time I started my senior year I had realized the path I was on wasn’t going to lead me to happiness. I knew I wanted to make a change, but I didn’t know in what direction. Enter Saha Global. I found out about the Global Leadership Program by chance through an email on my major’s Listserv. The program’s simplicity and elegance captivated me and I was amazed by the measurable impact it had in northern Ghana. I knew that this was something I would truly find rewarding. The experience was so much more than I expected. 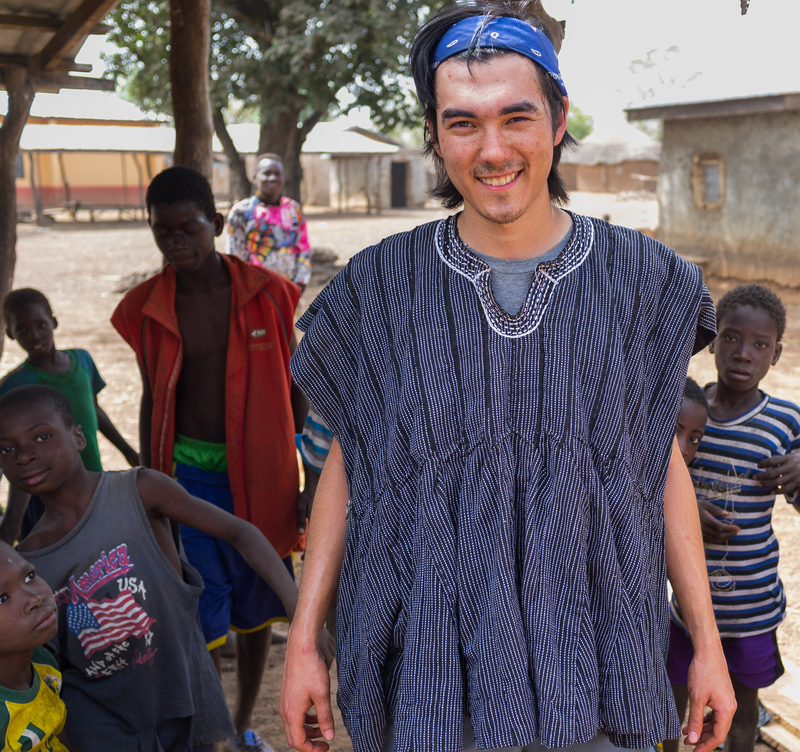 I spent three weeks with my team in the village of Takpili implementing a solar electricity business. We laid mud bricks and constructed the solar center by hand, trained four women to be self-sustaining entrepreneurs, and supplied all 80 households in Takpili with renewable energy and light. But above all else, I value the relationships I built along the way. 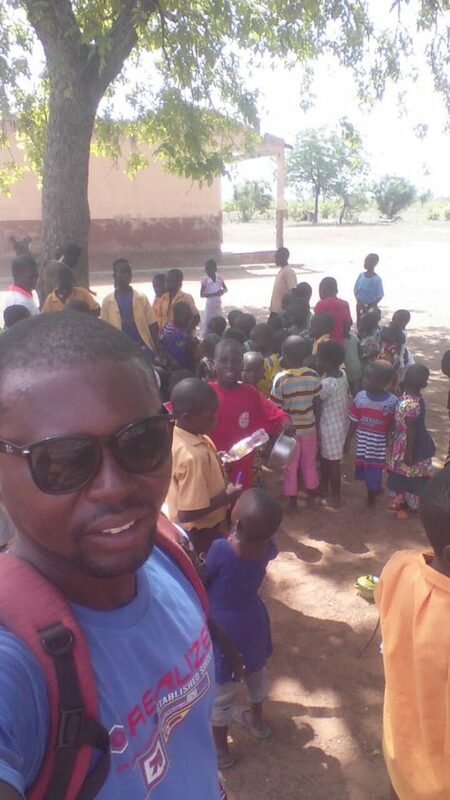 My fondest memories are of playing soccer with the children of the village, riding bikes through Tamale with Peter (our team’s leader-translator-extraordinaire), and learning to drive stick shift from our taxi driver, Hustla. One of the biggest things I’ve learned from this experience is how those receiving aid view the organizations providing it. In Takpili, a village that already had a Saha water business, the village elders were completely receptive towards our propositions for implementing a solar business. They trusted us because of the level of commitment Saha had already demonstrated in monitoring the village years after implementation. In contrast, they expressed to us how they often see organizations come through and make promises of improving quality of life only to find that what they provided was extraneous. There were remnants of projects that were started but unbeknownst to the village, got caught up in red tape and were never finished. It really helped me appreciate the work Saha is doing, from the comprehensive village scouting and research beforehand to the five year post-implementation plan for village independence. 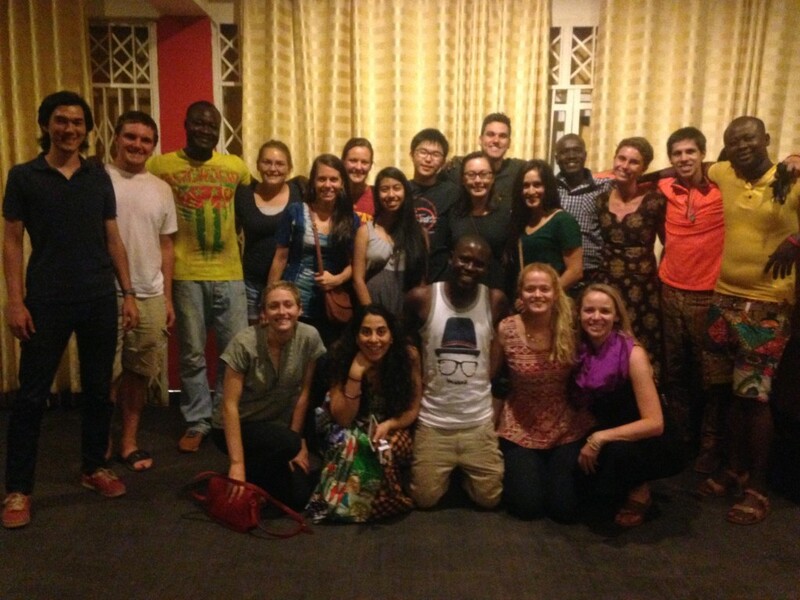 The Global Leadership Program shaped the way I think about my future. I know now that I want to work in international development, ideally in a field that also incorporates my engineering background. Currently I’m finishing up my undergraduate degree, looking to graduate in the spring, but I’m excited to stay involved with Saha in the future. Want to learn more about Matt’s experience or have any specific questions? Matt would be happy to tell you more and can be contacted at matts@vt.edu Also keep up with what Matt is up to now here! 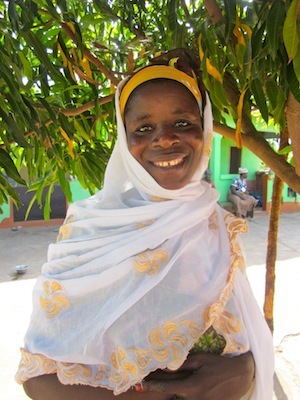 178 women have started small businesses with the help of Saha Field Reps. They own and operate 74 Water Treatment Businesses which serve 39,534 people. 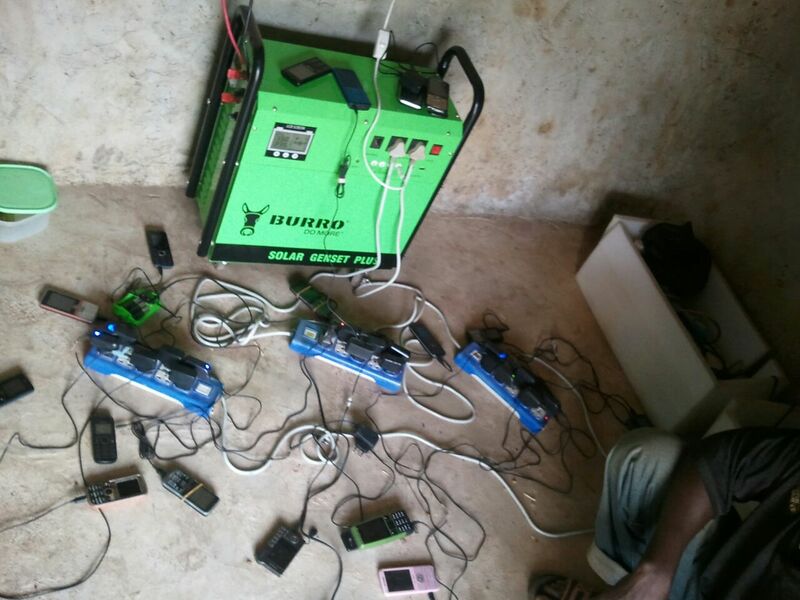 They also run 8 Solar Charging Businesses, serving 3,704 people. 100% of these businesses are in operation today. 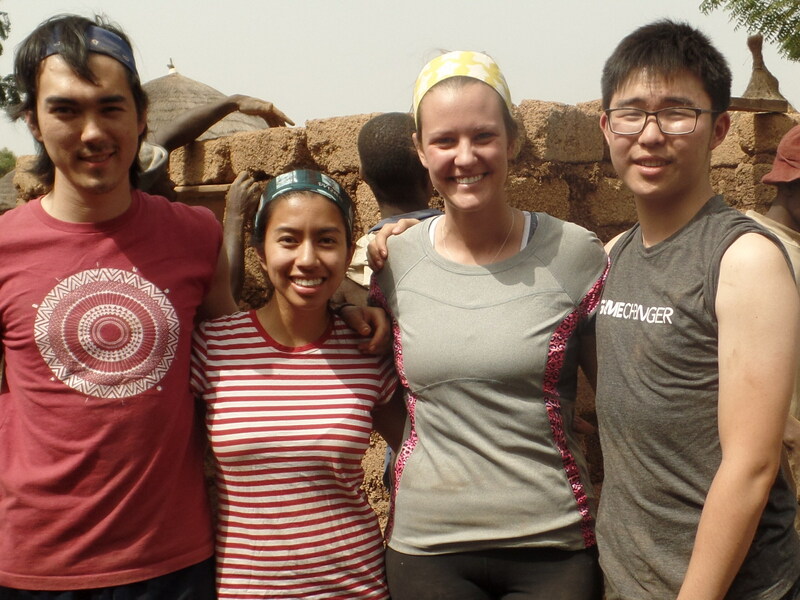 We want to take this opportunity to congratulate Jake, Shak, Julia, Sofia, Marlena, Tj, Julia, Wahab, Jenni, Orlando, Peter, Allison, Marsha, Sarah, Amin, Kiana, Matt, Kristina and Paul for their hard work in their communities. It was such a pleasure to work with this dedicated group. Cola nuts in hand for the meeting! Yesterday morning, Team Peter woke up at 5:30 for breakfast. 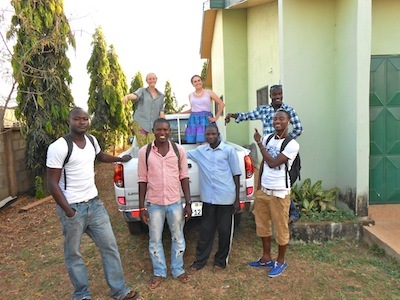 We had the usual – bread, eggs, and coffee/tea – before heading out to meet Peter (our translator and Saha team leader) and Hustla (our taxi driver) at the front of GILLBT. 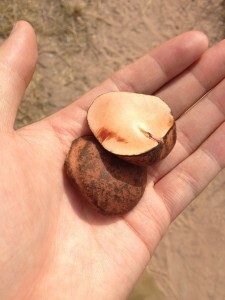 We left the compound headed for Tacpuli, but stopped on the outskirts of Tamale to buy cola nuts for the village’s chief (a Ghanaian tradition for important events). 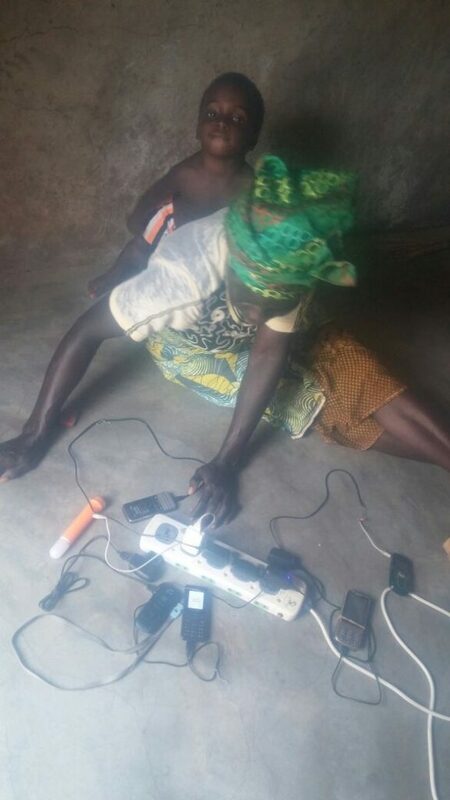 We were to pitch the idea of a solar charging center to Tacpuli’s council of elders. The drive took a little over an hour; most of us napped along the way. We awoke as our cab veered off the main road onto the bumpy dirt path that lead into the village. 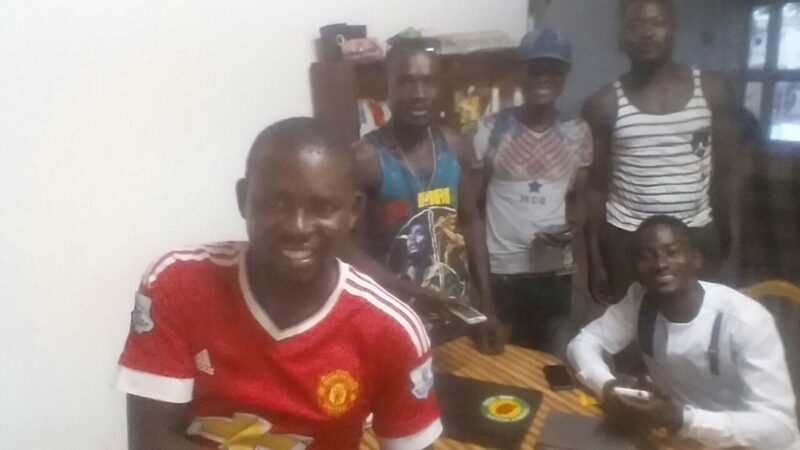 Peter was well known in Tacpuli – he had been the Saha representative who lead the implementation of the village’s water sanitation business a few years back and had been periodically checking in with the villagers since. 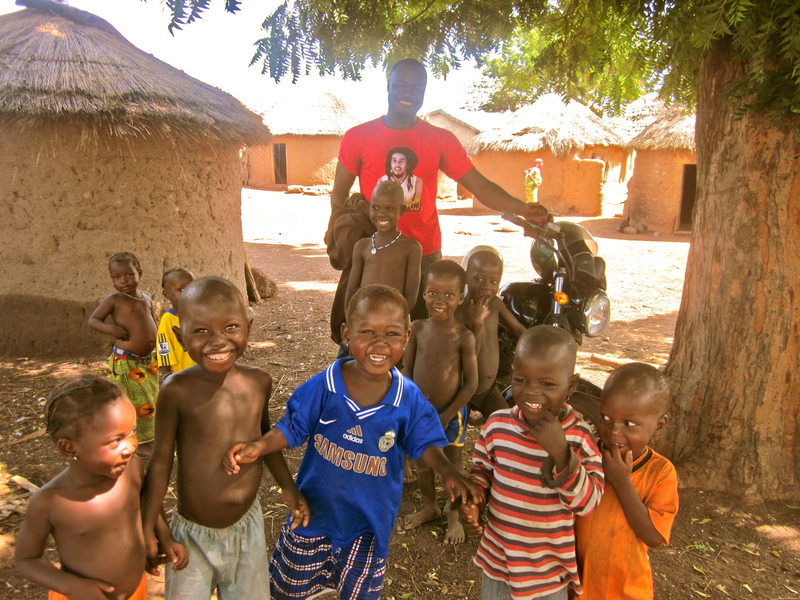 As we navigated between households towards the chief’s palace, we were greeted with smiles from those who recognized Peter. We waited briefly in the chairman of the village’s household as word of our surprise visit spread and the elders gathered at the palace. A crowd of awestruck and excited children gathered to watch us. When the elders were ready, we were lead into the compound where they had prepared benches for us to sit on. It was obvious that Saha Global was well respected in Tacpuli. The meeting was as painless as possible. 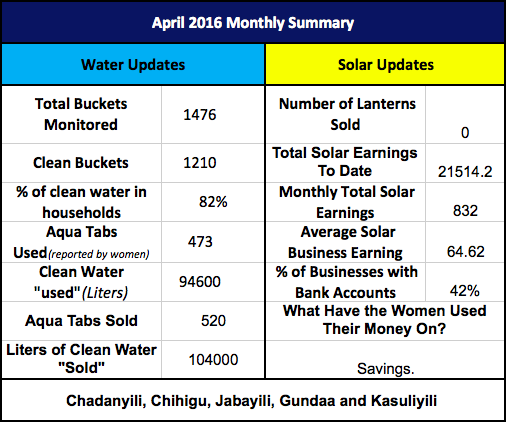 We explained that Tacpuli was selected for the solar program due to the great successes of their clean water business. We explained the dangers of kerosene and lead acid batteries and demonstrated the durability of the new lanterns and rechargeable NiMH batteries. Peter relayed our message in Dagboni to the chairman who spoke on behalf of the elderly chief. They expressed how eager they were to place their trust again in Saha, recognizing our persistent dedication to the well- being of their people, and asked when we wished to begin construction of the center. We will be visiting them again today to announce our plans to the entire community, and construction will commence immediately after. On our way out, the chairman flagged our taxi down and had us return to his household. 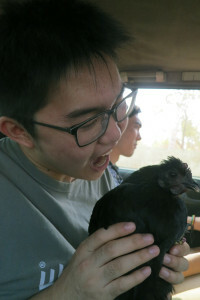 He had prepared a parting gift for us: 7 yams and a live chicken! We are all looking forward to getting to work! 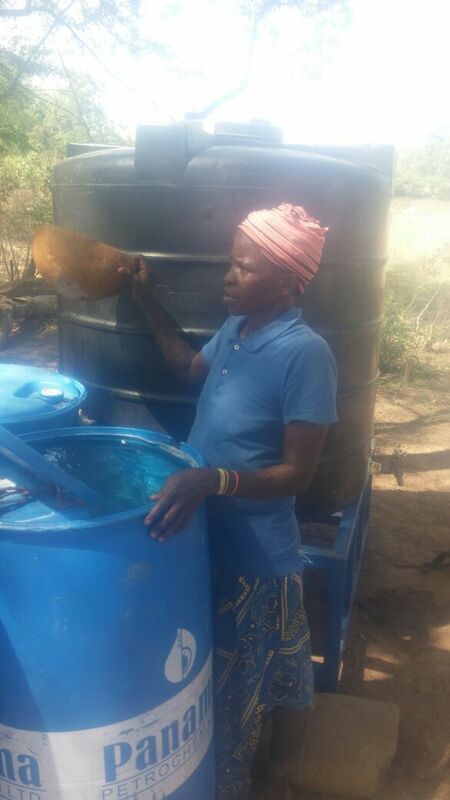 The metal polytank stand CWS entrepreneurs are now using in a number of communities. The stand allows for the water treatment centers to be moved to different water sources. Back in June, I wrote a blog post about metal polytank stands and how CWS was going to test them in communities that use multiple water sources. You can read that post here. Since then, CWS has distributed metal polytank stands to 10 different communities: Gbandu, Jarayili, Kabache/Kasawuripe, Kindeng, Kpalbusi, Kpalbusi, Libi, Tacpuli, Tindan II and Tunga. These are villages that CWS targeted because of the challenges the entrepreneurs were facing in keeping their water businesses open year round. Most of the CWS water businesses are set up next to dugouts where community members already go to get their water. 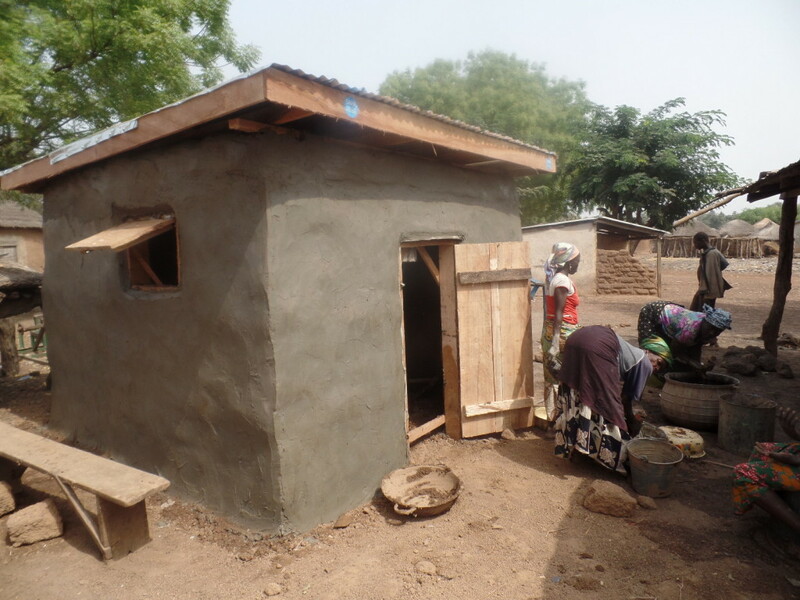 Center implementation next to the dugout is ideal because when women fetch water for household use, they can buy clean drinking water from the centers without disrupting their daily routines. 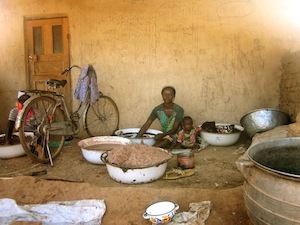 Women fetch water from a typical dugout in Kadula. But what happens when people go somewhere closer to fetch water? 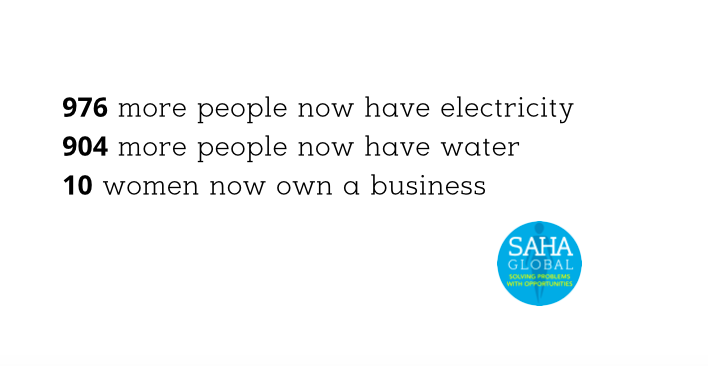 Well the entrepreneurs who sell water (usually) lose business. 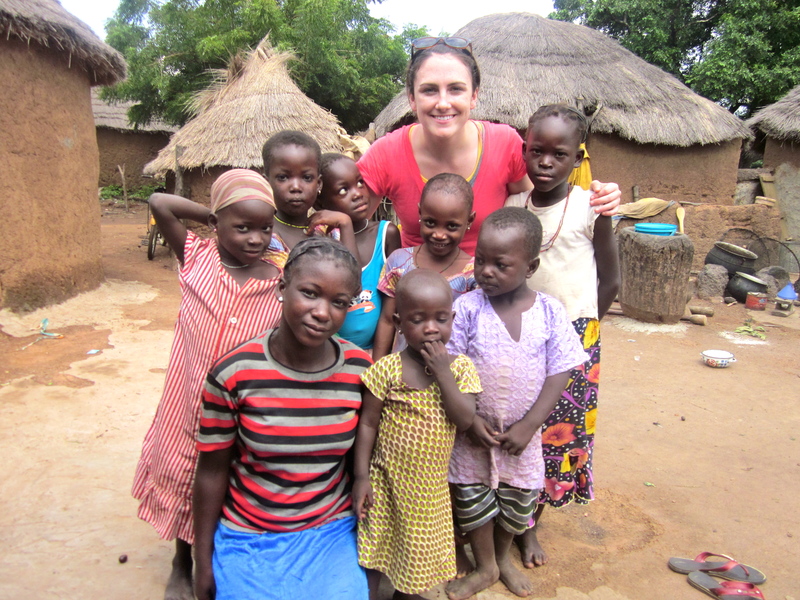 The community members living in these CWS villages are practical people with busy schedules. If the village women can save time by fetching water somewhere closer to home, they are going to make the switch and avoid the extra trek to buy clean water. The CWS field staff observed this in a number of communities. 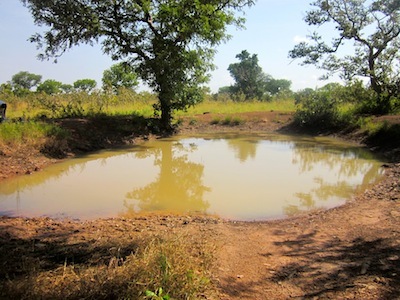 In the transition from the dry season to the rainy season and vice versa, the level of the water sources can drastically fluctuate. 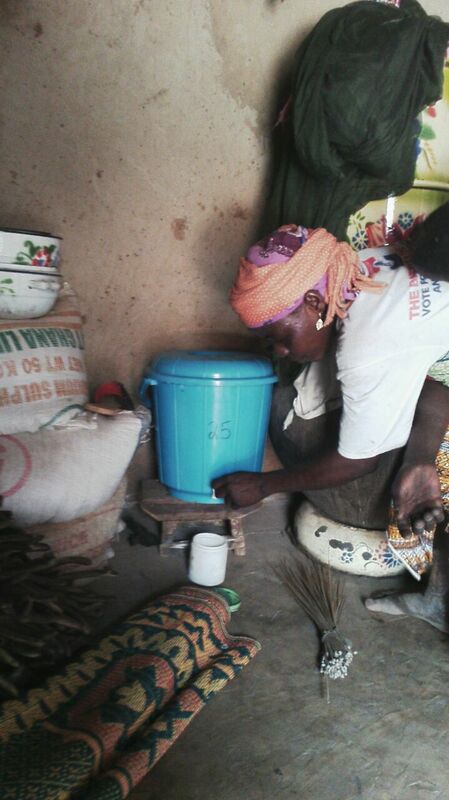 In the Northern Region villages, the rains determine how much water is available. New dugouts form for short periods of time, a river can become more accessible or even hand dug wells are used to collect rainwater. With the low-tech nature of the CWS model, the women can move the location of their water businesses as long as there is water to treat. 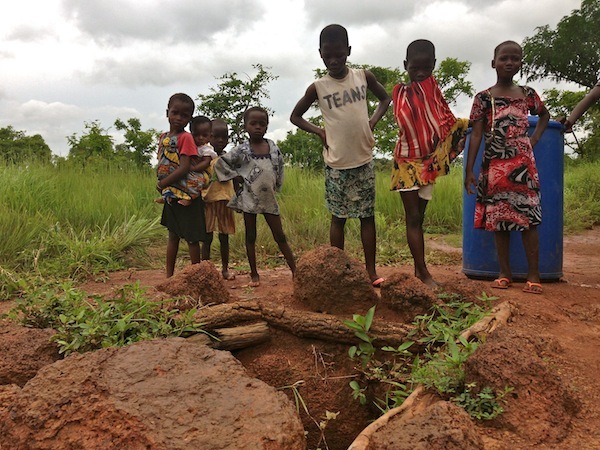 Children pose by a hand dug well in Kabache/Kasawuripe, where the entrepreneurs decided to move their center to treat water. With the help of a welder, CWS created the metal polytank stand and modified the CWS model to the changing of seasons and water levels. Some of the water businesses easily adapted to the metal polytank stands. 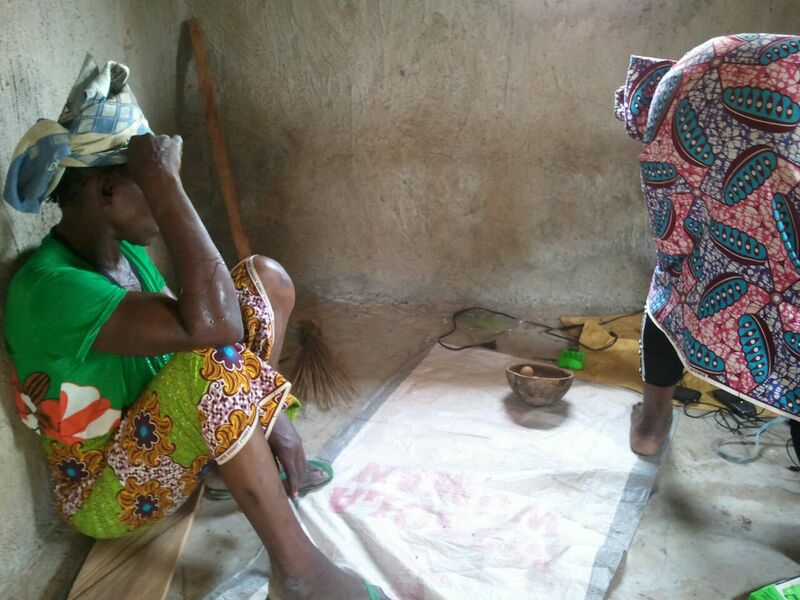 For example, in Kpanayili, Affilua, Anatu, Fati and Zilifau used their metal polytank stand to move the center to a closer dugout that only has water in the rainy season. Their sales drastically increased when they switched water sources. 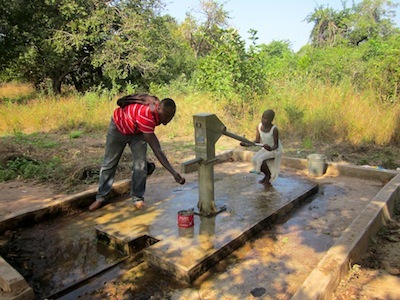 In Tacpuli, Lasinche moved the water business from the dugout to a smaller dugout closer to the community. Kpanayili and Tacpuli have been operating with the new stands just as the CWS field staff envisioned. And the entrepreneurs have reaped the benefits. The water business owners in Kpanayili from left to right: Zilifau, Affilua, Fati and Anatu. The smaller dugout in Tacpuli. The entrepreneurs have lower sales during the rainy season because community members have the option to collect free, clean rainwater instead of buying water from the centers. 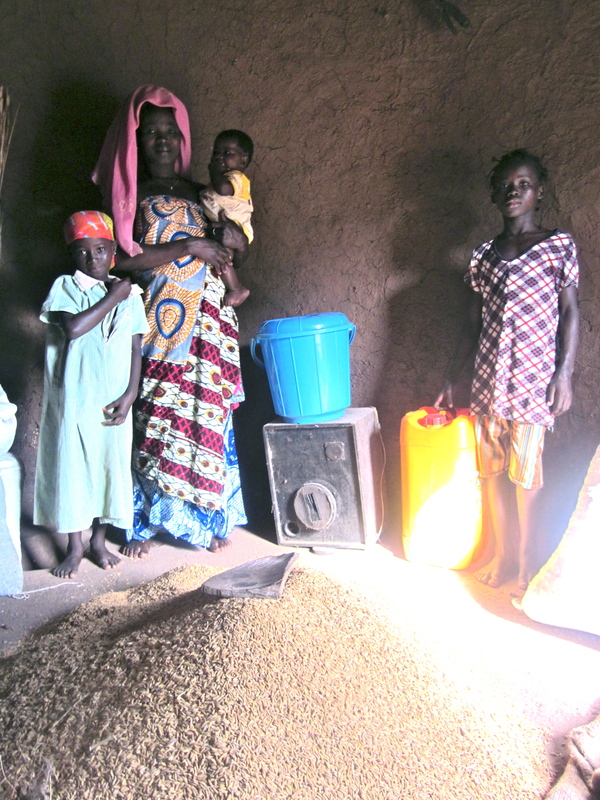 In Libi and Kpalbusi, the rains delayed their transition to using the metal polytank stands. 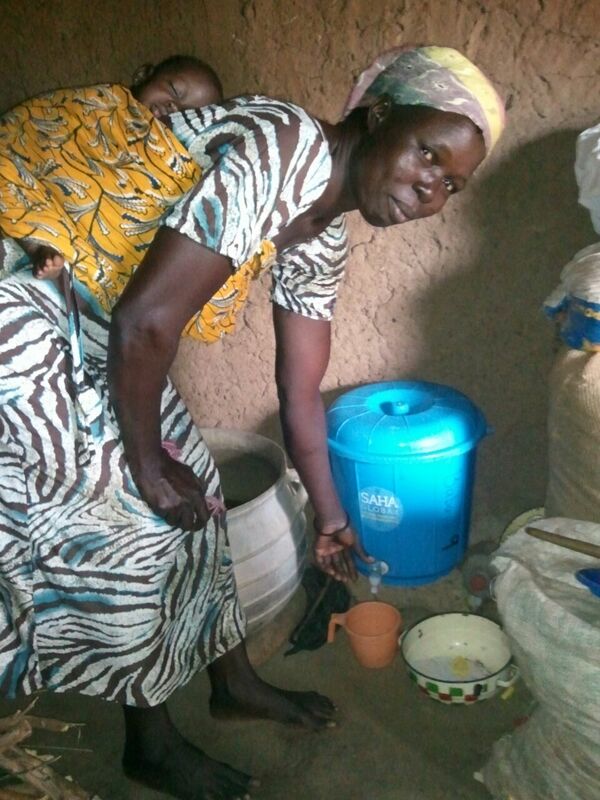 In Libi, the water business entrepreneur, Cheriba, banked on her community collecting rainwater in July and August because she was busy on her farm. As a result, the water business was left empty at the river where nobody goes to get water this time of year. 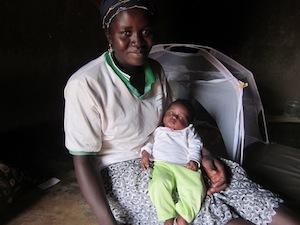 The CWS field staff is working with her to bring the center to a closer source, so people will have the option to buy clean water when the rains stop. 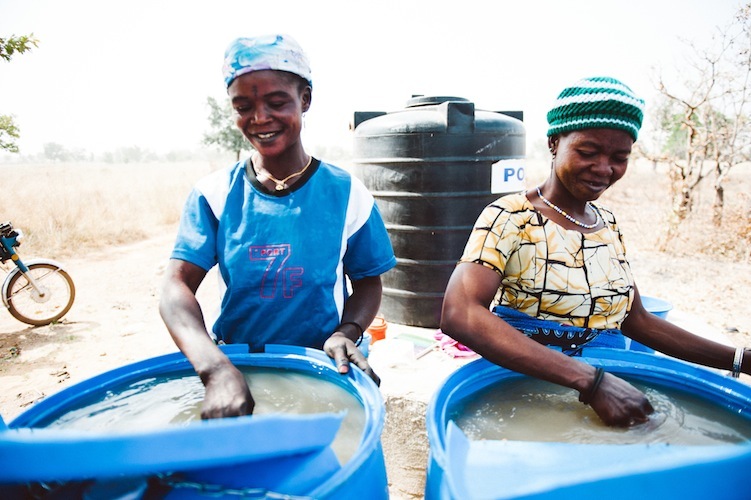 In Kpalbusi, Huseifa, Zilifau and Maria moved their water business from the dugout to the center of town to treat rainwater. The problem was they were not receiving enough rain to treat. Their center was empty all of July. 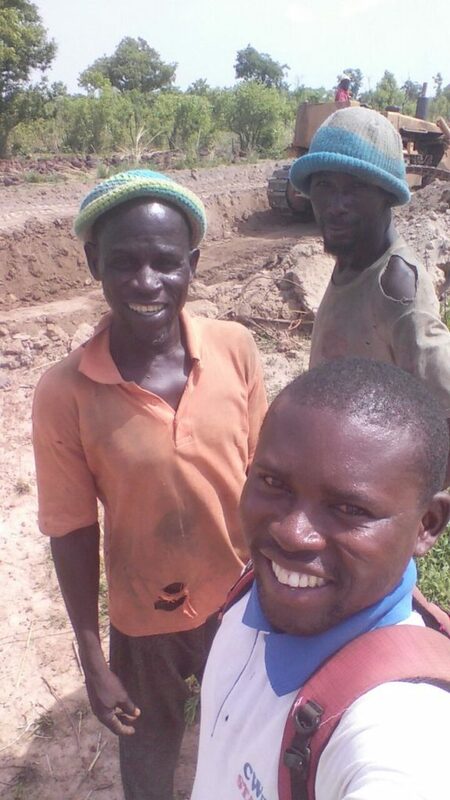 As of the beginning of August, the entrepreneurs have moved the business to a nearby stream where they will be able to keep the center up and running until the dry season. An example of how water levels can change in the Northern Region. 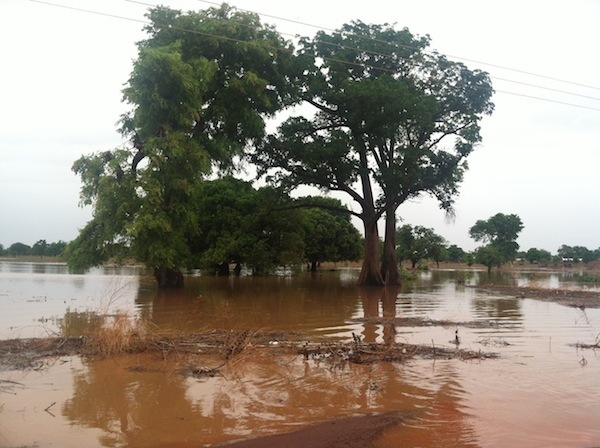 Here is a road flooded by a stream in Tamale after a heavy rain. With the drastic change in water levels throughout the year, the CWS entrepreneurs have to alter the way they do business. This could mean treating rainwater, dealing with the change in sales from the dry season peaks to the rainy season lows, or even moving location. In the past, CWS has found that it can take a year of dealing with these challenges for the entrepreneurs to become familiar with the way their individual businesses operate. The metal polytank stands are going to be added to this equation of business operations. The entrepreneurs are going to have to ask themselves: When should we move the centers? 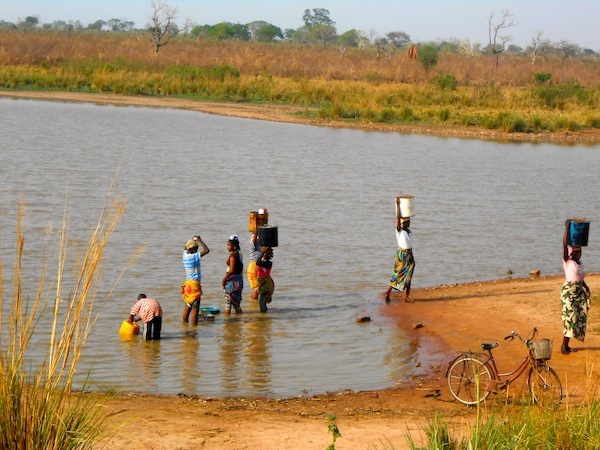 Where are people going to fetch water? What location will bring in the highest sales? Who can I find to help us move the centers? This will take some getting used to. But the metal polytank stands should help in keeping these businesses open year round, which is the end goal after all. First week back in Tamale and Hamatan is in full swing! Hamatan is when a dry-dust wind blows in from the Sahara. This happens from late November until mid-March all over West Africa. This Saharan wind engulfs the city of Tamale every year with a thick orange cloud of dust, leaving us with chilly nights and burning hot days. What does this mean for CWS? Well for the staff it means that we finish our days with an orange dust facemask and dirty feet. For CWS project manager, Peter, it means he comes back from the field with a carrot colored beard. For our 47 communities, the Hamatan wind does not affect water sales per se but the seasonal changing of weather has a big impact on where people get their water. 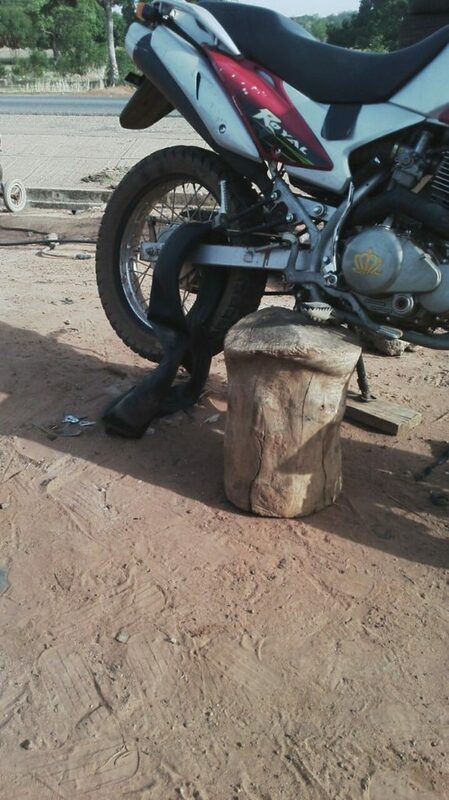 During Hamatan, it gets drier and drier in and around Tamale. 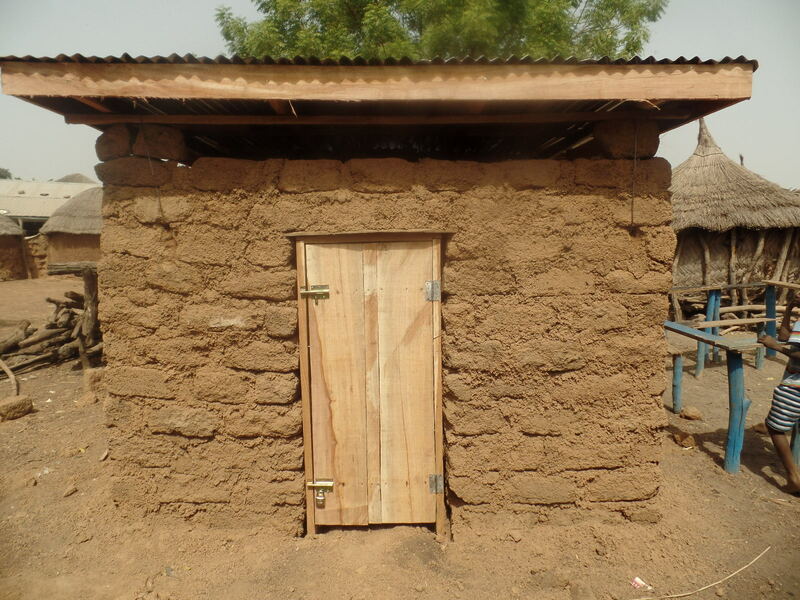 This means that water sources like manmade wells; boreholes and dugouts start to dry up. In many of CWS’ villages, the community water sources change, which creates challenges for the entrepreneurs who run the water businesses. This has several implications. Some women have to close their centers for a few weeks as they transition to treating water from a different source, some have to pay donkeys or motor kings to bring them water to treat and some move their water treatment centers multiple times… All the women are unique in their approach to dealing with seasonal transitions and CWS ensures that they are coming up with a plan that’s right for them. 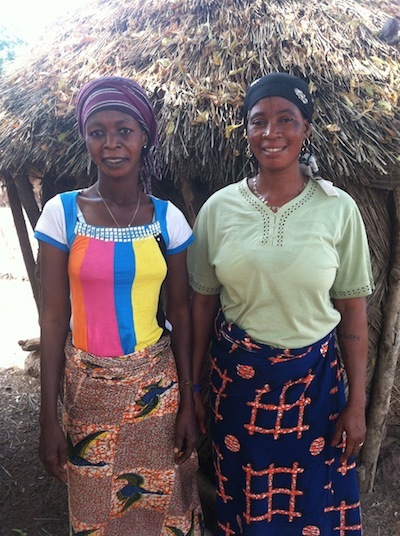 Fati and Amina aka “Samlenna” or TZ seller are the women who operate the water business in the village of Gbung. When it rains, the women move their center from the dugout to the market in the middle of town and treat collected rainwater. 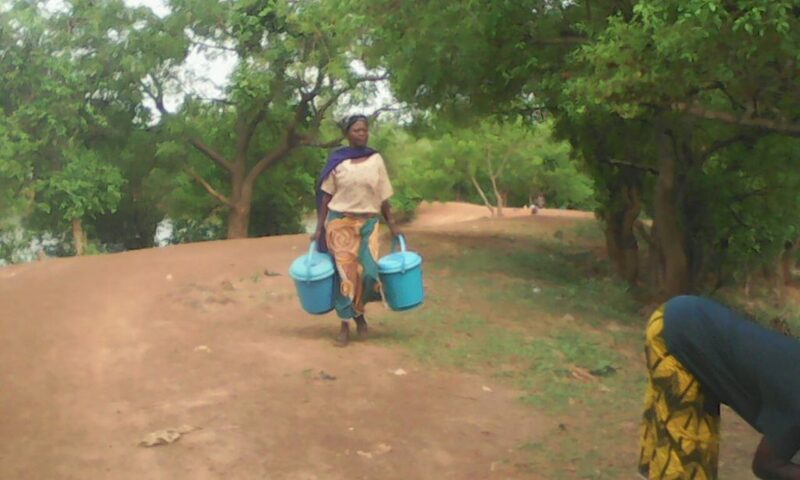 In the Hamatan season, the people who live in Gbung get their water from a few different places. They get it from a nearby stream and from a closer but smaller dugout that dries up for half the year. 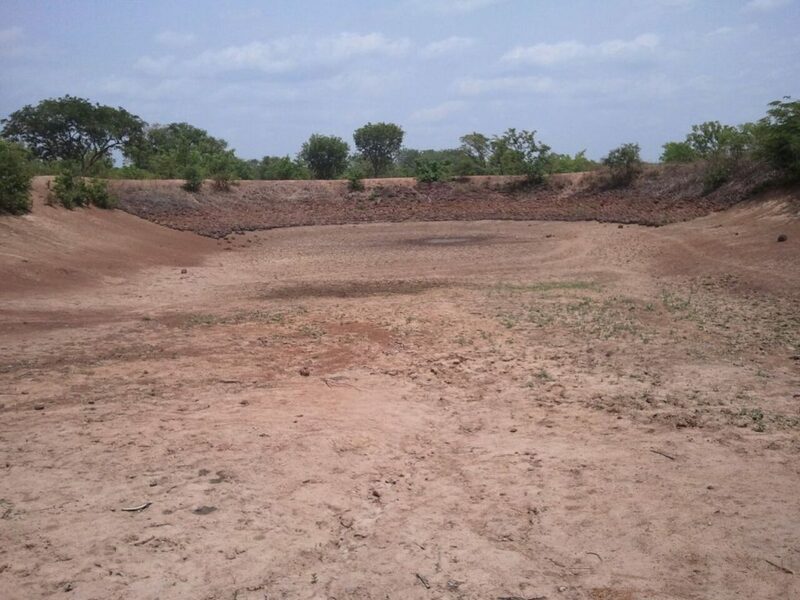 No one is collecting household water at the dugout where the polytank initially was built. So for the time being, Fati and Samlenna are paying a motor king to bring them water. The women are working on adjusting the price of water to reflect the increase in water treatment costs. The center is still running despite these seasonal challenges! 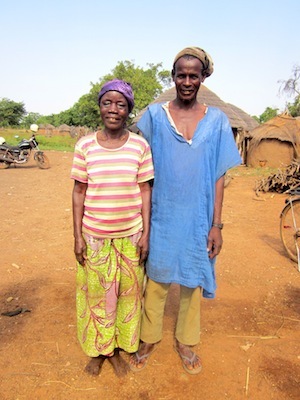 In nearby Libi, Cheriba and Ramatu closed their center for a month for a number of reasons. 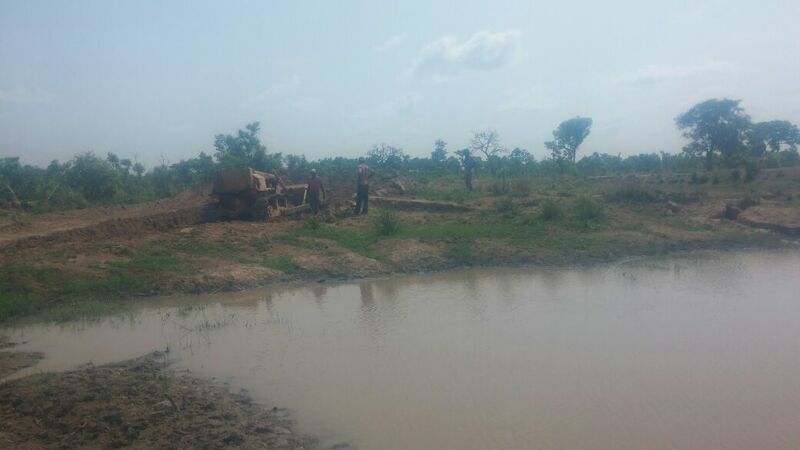 In December, the path to their stream where the polytank stand was initially constructed was still muddy and overgrown. 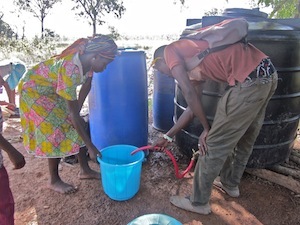 Cheriba told CWS field staff that her fellow community members were getting water from a number of sources. Some people got it from manmade wells, some got it from smaller dugouts and some had stored rainwater. She said that if she opened for business nobody would come. 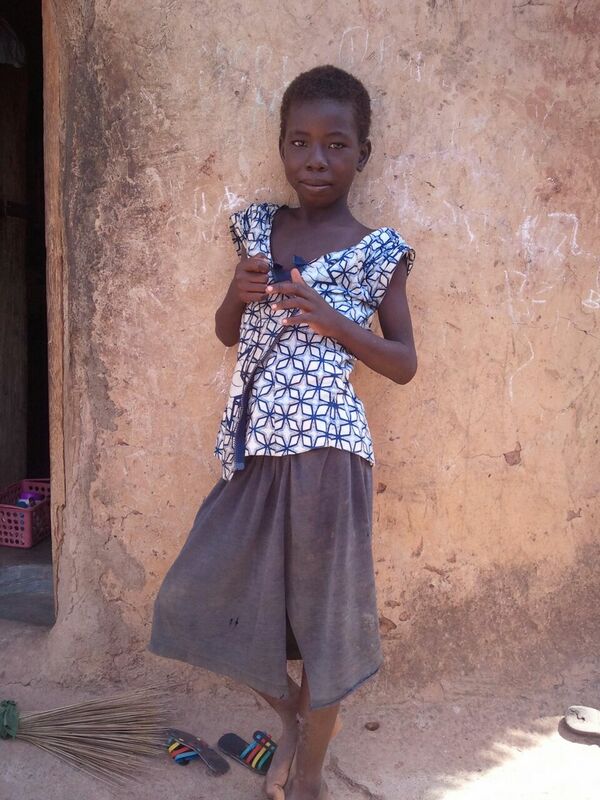 She wanted to wait until people started going back to the stream to collect household water. Ramatu and Cheriba will be opening for business this week! Tacpuli was the lowest performing CWS village in October 2012. Lasinche, the woman who runs the water business in Tacpuli was having a hard time getting people to come to buy water post-rainy season. Many people had rainwater stored in their houses and did not want to make the muddy trek to the dugout to buy clean water. 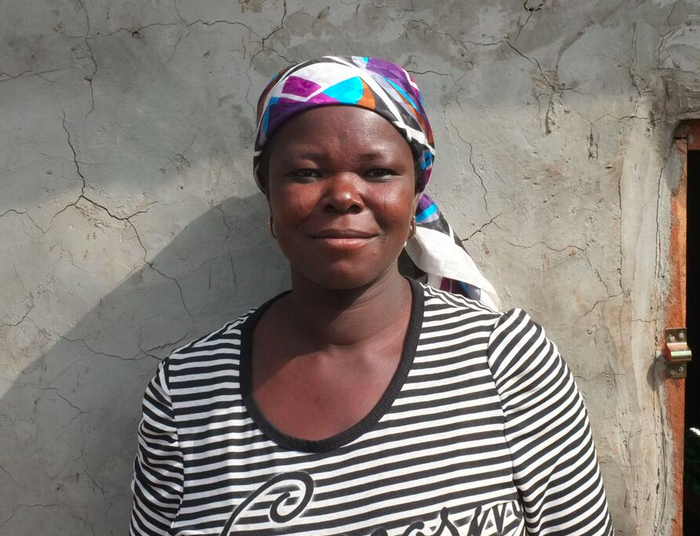 Lasinche tackled the problem on her own and moved the water treatment center to a well that was closer and more accessible for the community. Lasinche kept the center at the well for all of December and for the beginning of January. She moved the center back to the dugout and sales are going well for her! Weather patterns, climate change and seasonal challenges all play a major role in determining where people get their drinking water and the amount of water that is available year round to treat. 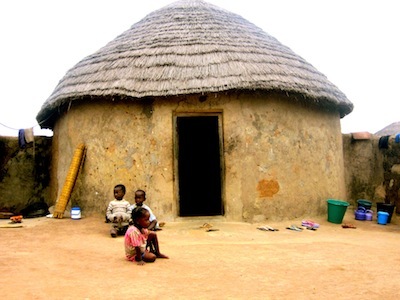 In Tacpuli, Gbung and Libi, three villages that are very close in proximity to one another, these factors all affect them in different ways. After working in these communities for a few months, I’ve noticed that the best solutions are formed organically from the entrepreneurs or the community members themselves. As Shak, the CWS assistant project manager always says, “We are not the ones getting our drinking water from the village.” He makes a good point. While CWS works its hardest to make sure all 47 water businesses are running effectively, we will never be able to control the weather and we are not the ones drinking the water. The women and the people who live in these communities need to be the decision-makers for seasonal problems that arise throughout the year. And this goes for all development projects, not just water. 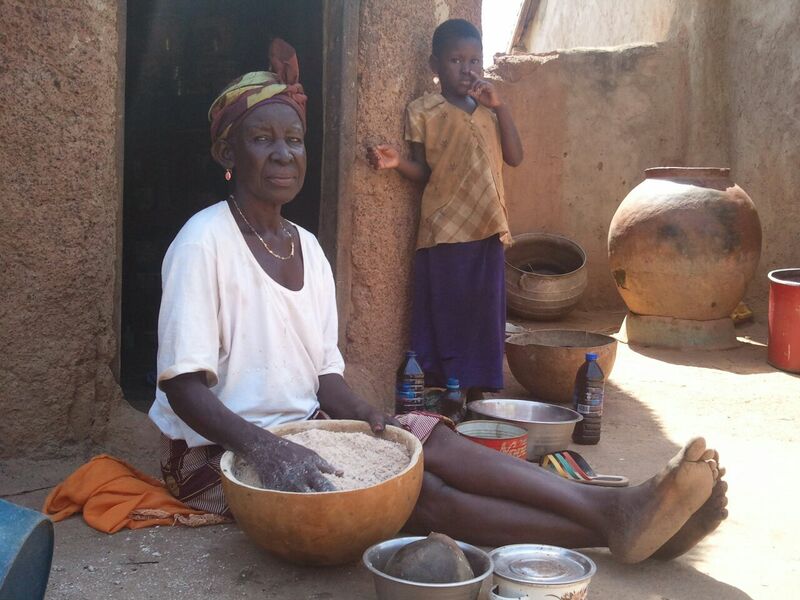 When I was grocery shopping in Tamale a few weeks ago, I came across a woman selling bread at a food stand with a banner written across the top that read, “To be a woman is not easy”. Almost all the shops in Tamale have storefront names with powerful and sometimes silly sayings such as this one. To give you some examples, “Everything by God”, “Serious Man Hot Food”, “Jesus Loves You Barber Shop” or “Home Sweet Home Kenkey”. The names usually make me chuckle but this one made me think. I immediately thought of the women entrepreneurs that run the water treatment centers in the CWS communities. 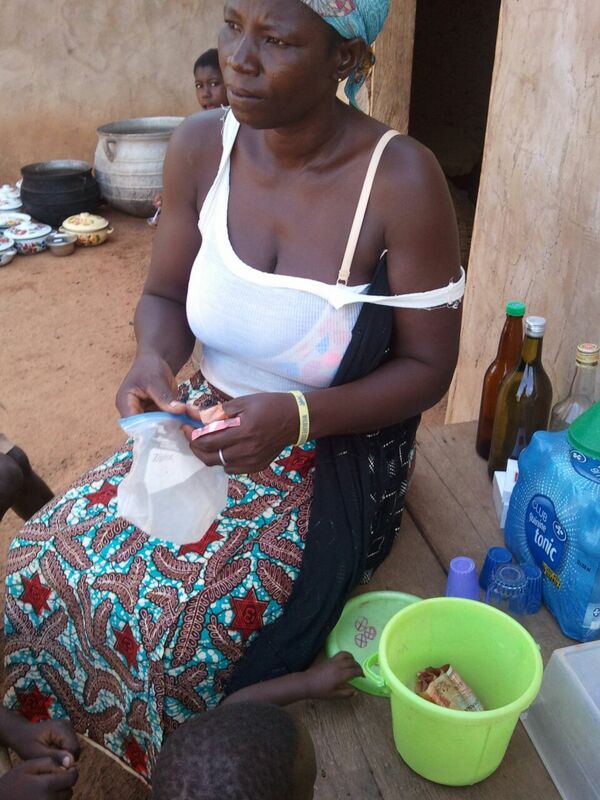 They are the complete embodiment of this very shop name… to be a woman is not easy in the slightest, especially in a rural village outside of Tamale. 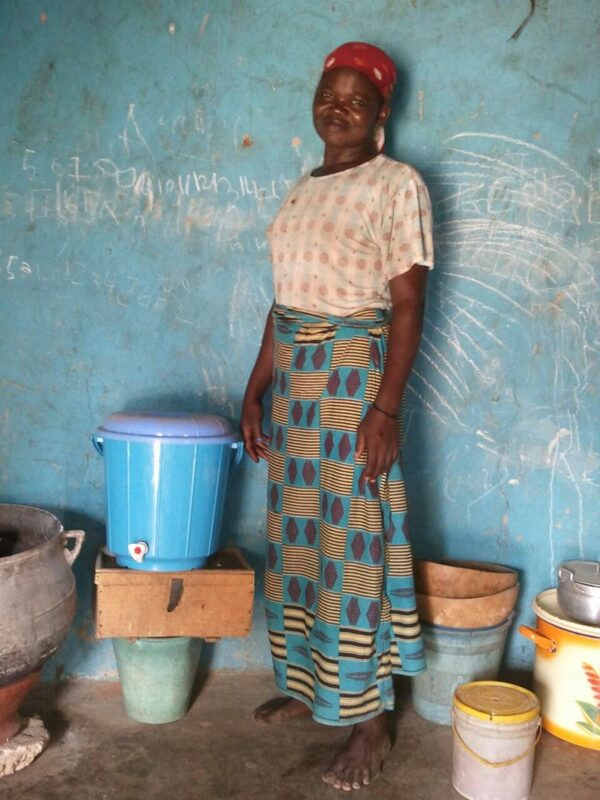 Lydia, one of the women who runs the water business in Sakpalua, recently talked to Spring 2012 fellow, Chelsea Hodgkins, about what it means to be a woman in Sakpalua versus a woman living in Tamale. “The women in the city have it easy”, Lydia told Chelsea. 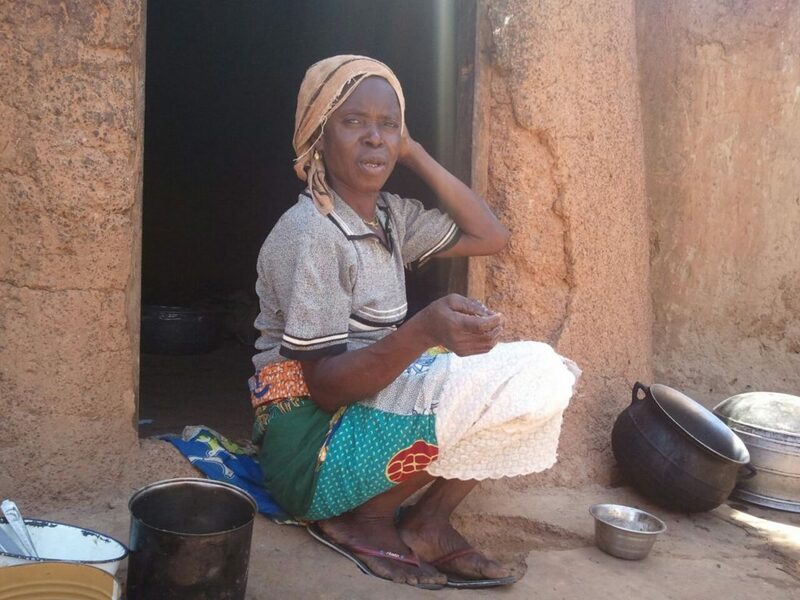 “In the village, the women go to their farms very early in the morning and then are expected to come home, take care of the children then clean and cook for the family”, she continued. After hearing snippets of their conversation, I wanted to hear more about the lives of the women who run the water businesses on top of farming and taking care of their families. 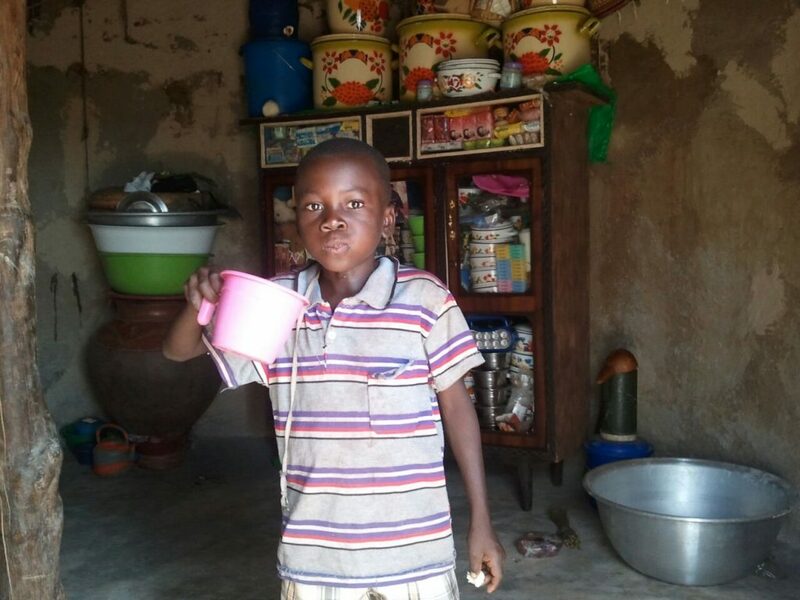 Right now is one of the busiest times of the year for subsistence farmers because it is the peak of the harvest season in the Northern Region of Ghana. After the rains, everyone wants to collect their crops before it gets too dry. Some farmers leave as early as 4:00 AM so they can start working in the morning while it’s still cool. Farmers harvest groundnuts, maize, yam, soy beans, cassava, hot peppers, okra, tomatoes, rice, firewood, tobacco, cotton and cow peas to name a few. Not to mention that when it stops raining, the weddings and funerals start in the North. So how do the women who run the water businesses find the time or the incentives to sell water during the peak of the harvest season? Well, it’s complicated. For starters, people have run out of rainwater so the only option they have for clean water is treated water from the polytank. 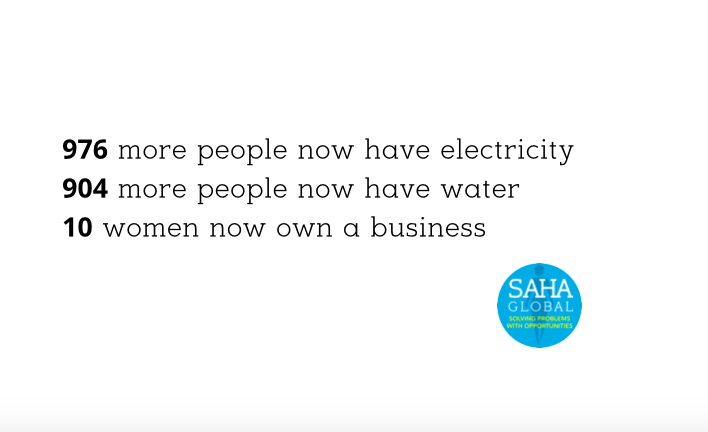 This means that the demand for clean water is there. And the incentive that drives many of the women to work at the centers is the same incentive that gets people to work at desk jobs back in the US, they want to make money to pay the bills. This monetary incentive has to be there because if women work at the centers strictly for the greater good of their communities, they will have no money to pay for aquatabs, broken parts or for the time they could have spent on their farms. 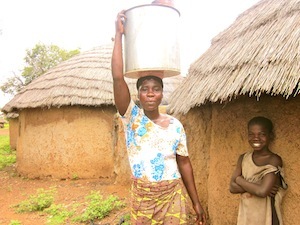 But what happens when people in the communities are collecting water from different sources? This is where the plot thickens. 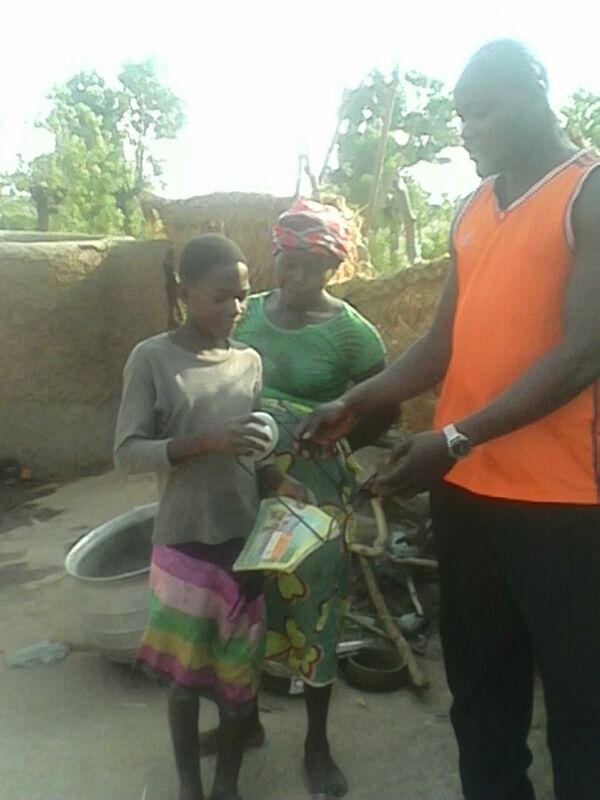 In Kpanayili, the people in the community are collecting water for cooking, cleaning and washing at nearby wells and streams. They will get water from these sources until they dry and then they will go back to getting water at the dugout. 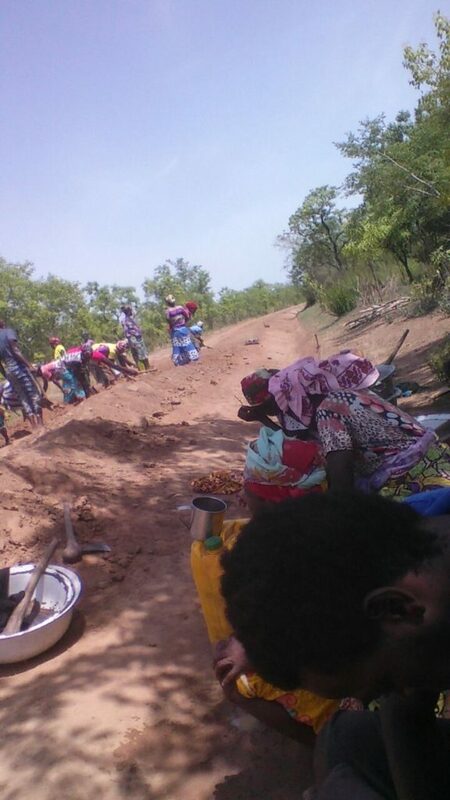 As noted before, the women in the communities already have long days so if they can lessen their load by shortening the walk to get water, then they will do it in a heartbeat. The problem is that the water treatment center is next to the dugout. 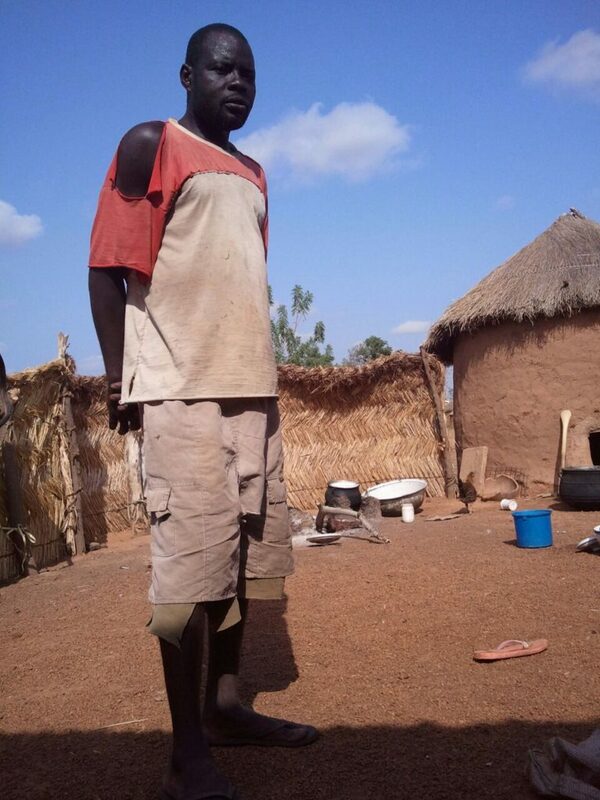 This is not the case in all CWS communities at this time but there are several that deal with challenges such as this during the transition from the rainy season to the dry season. So how can we convince people to make the extra walk just for clean water, while we wait for these other sources to dry? It’s not easy. While it may seem like clean water should be high on the priority list, the reality is that it’s not for everyone. Farmers are focusing on their harvest and prioritizing food over clean water because this is their sustenance. Farming is how people survive. If that means drinking contaminated water for 2 weeks so that they do not have to walk as far and as a result get more time on their farms, then they’ll take the risk. In the long run, what will 2 weeks of diarrhea do if it means having more money for the family this year? If you asked this question to a public health official, they would answer A LOT. But the women working in these communities are not public health officials; they are simply trying to make their work as easy as possible. Because after all, to be a woman is not easy. 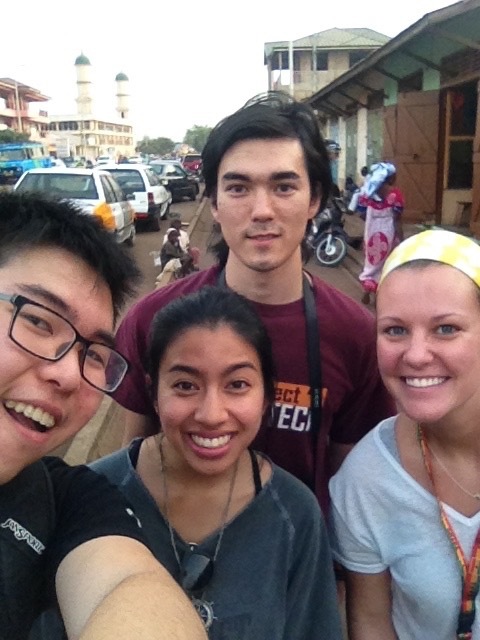 Back to Tamale and it feels so good! After two weeks of training and saying farewell to some pretty awesome fellows, I have officially started as Ghana Country Director. It feels so good to be back with CWS! With the 6 newly implemented villages, CWS now has 38 villages in its monitoring rotation. Once the fellows leave, CWS continues to monitor its villages. This includes checking in with the wonderful ladies that run the water treatment centers, as well as doing household visits and taking water samples. 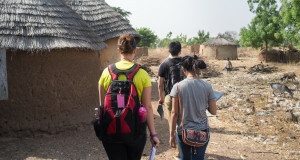 Post-implementation, each new village is monitored once a week for the first 6 months and then less and less as the villages become self-sustainable. It is the start of the rainy season here in the Northern Region of Ghana, which means that many of the villages (that have tin roofs) are transitioning into using rainwater collection techniques to harvest water with their safe storage containers. 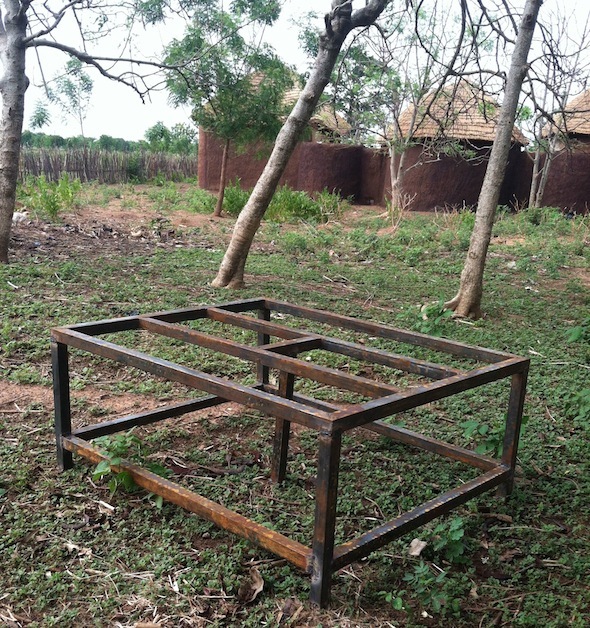 This is because some villages (like Gbung and Zanzugu Yipela) do not use their dugouts during the rainy season. 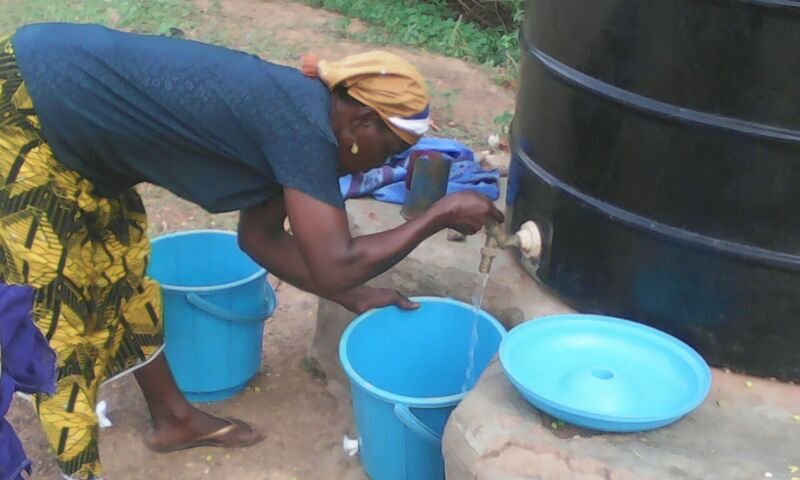 While sales at the water treatment centers have been low in many of these communities that harvest rainwater, they will pick right back up when the dry season comes underway. 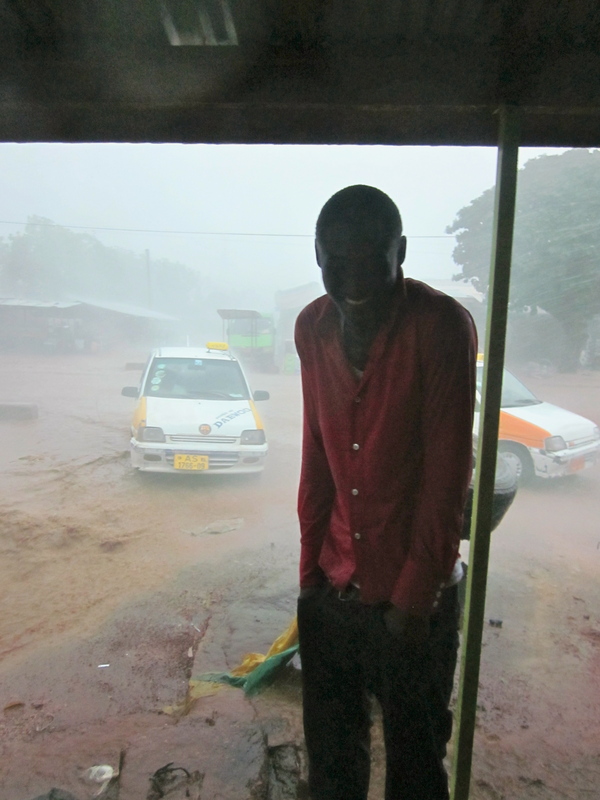 As for now, the CWS staff in Ghana is just trying to stay dry with all the rain! Shak cheesin’ with some kiddos in Wambong & Wahab keeping dry during a storm! Happy 4th of July! 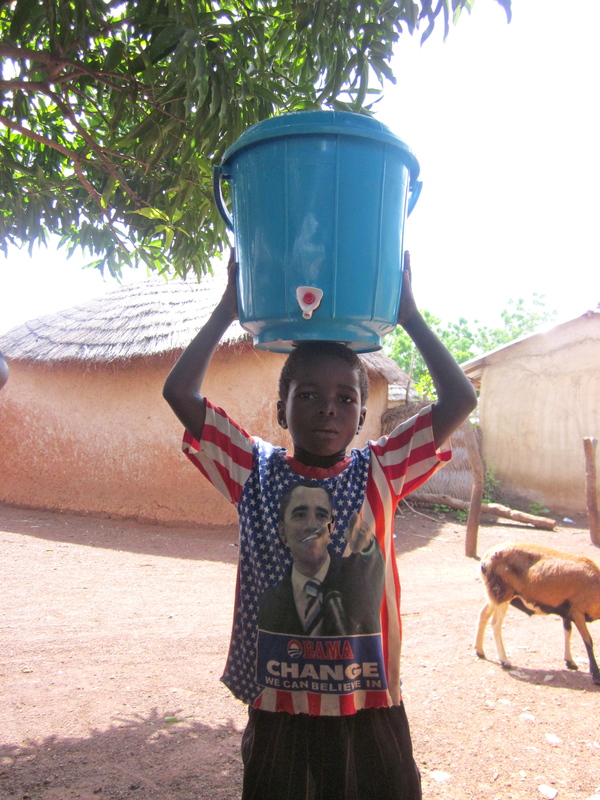 — a boy in the village of Cheko shows off his American and clean water pride! 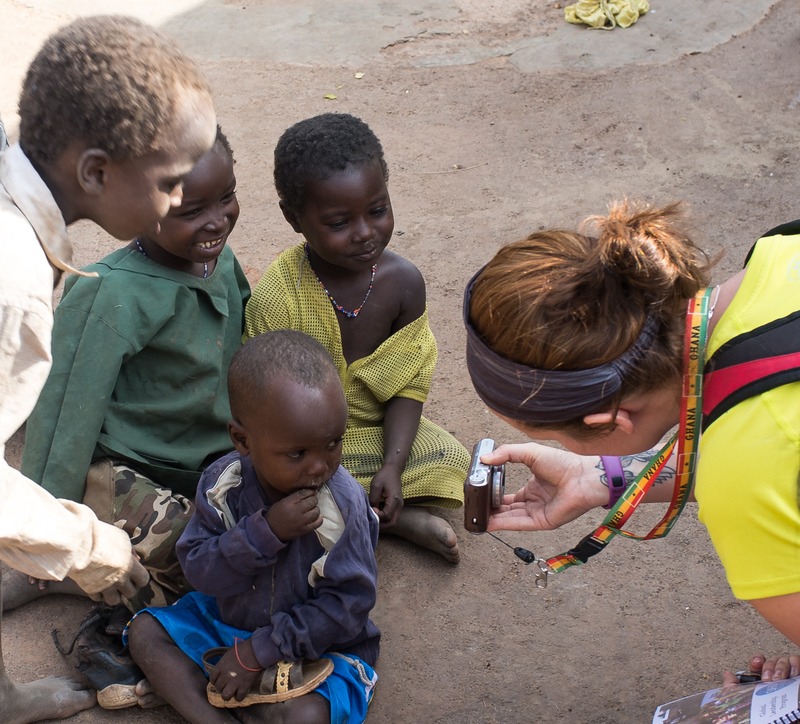 The children in Nyamaliga can’t get enough camera action! Rainy season, means rice harvesting! 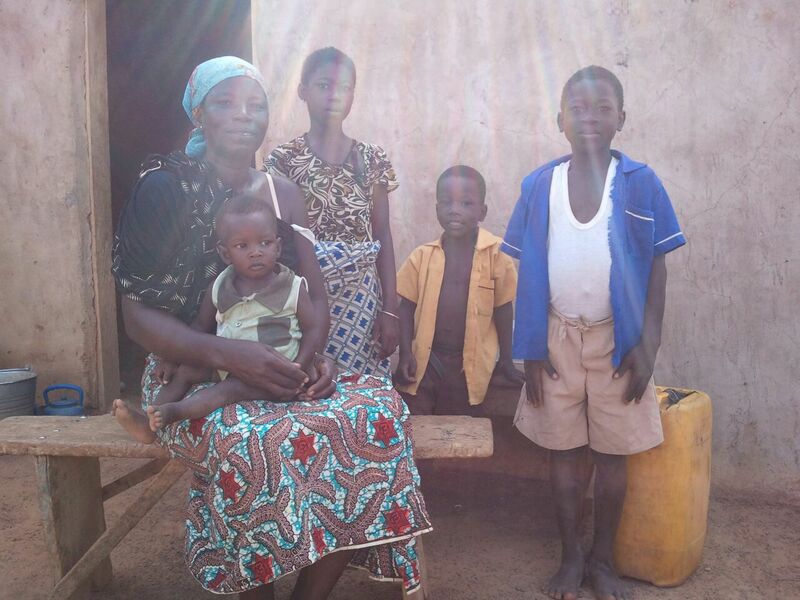 A family in Tacpuli poses with their full bucket of clean water.